Chiang Mai is the crown jewel of northern Thailand. With rich history, amazing cuisine, fantastic architecture and great culture, Chiang Mai is a bucket list destination. Planning a holiday to Chiang Mai can be overwhelming - there is so much to do there that it can be difficult to prioritise what to see and do. One of the best parts of Chiang Mai is its wealth of great museums. Whether you are interested in art, history, science, politics or war, there is an excellent museum for you to visit in Chiang Mai. The National Museum of Chiang Mai is a great starting point for your journey. 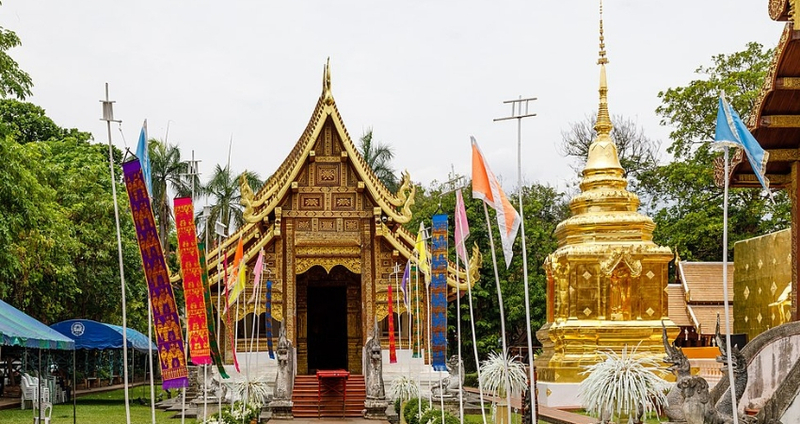 This museum contains galleries and exhibits focusing on the history of the northern Thailand region with a special emphasis on the Kingdom of Lan Na, which reigned over the Chiang Mai area for almost five hundred years. This museum is a must-visit for history buffs and those interested in exploring some of the historical and archaeological sites in the region. This museum is operated by the Thai government. The Chiang Mai National Museum is open Wednesday through Sunday from 9 AM to 4 PM and costs 30 baht to enter. Much like the Chiang Mai National Museum, the Lanna Folklife Museum offers an excellent introduction to the Lan Na culture. The museum features several intricate and fascinating life-sized dioramas that depict life in a Lanna village. These are great for adults and children to gain a better understanding of life in the historic Lanna region. The museum does not have a large selection of actual artefacts, but the life-sized dioramas still provide a fascinating experience. The museum is located in a historic 1935 colonial-style courthouse and is open six days a week (closed on Mondays) from 8:30 AM to 5 PM. Tickets cost 90 baht for adults and 45 baht for children. The Museum of World Insects and Natural Wonders is a world-renowned museum dead bugs. This private museum was founded by a husband and wife team. The wife is an insect expert who is known as a world leader in mosquito research, while the husband has spent decades researching malaria. When you step foot into this museum you will be greeted by thousands of insects pinned on all the walls in this three-story building. Each display of insects contains a placard with scientific and anecdotal information about the curators' personal experience with these insects. This museum exists to tell a story about insects and their interactions with humans and the vision of the curators. The museum can be a bit creepy at times, with several surreal works of art scattered throughout but ultimately provides a fascinating and incomparable experience that simply must be seen even for those that are not otherwise interested in insects. The museum is open daily from 9 AM to 5 PM. Tickets cost 200 baht. For another truly unique experience, visit the Chiang Mai 3D Art Museum. This is the largest 3D Art Museum in the world and features 130 different 3D paintings that explore eight different themes ranging from Lan Na and Thai history to dinosaurs to classic art. If you have never been to a three-dimensional art museum, this is a great spot to try for the first time. You will be amazed by the detail and the interactivity of the exhibits. The paintings are great for children and adults. Place yourself in the paintings and take lots of pictures! The museum is open seven days a week from 9 AM to 9 PM and costs 300 baht for adults and 200 baht for children. The Chiang Mai Air Force Museum offers an exceptional history of the Royal Thai Air Force and its efforts since its founding in 1930, including its involvement in World War II and the Vietnam War. Numerous aircraft are on display from the Royal Thai Air Force in service from 1914 to the present day. The museum also features a number of World War II-era Japanese aircraft, providing a unique opportunity to see the planes used by the Axis powers in the Pacific Theater during World War II. The museum is open from 8 AM to 3:30 PM six days a week (closed Mondays) and is free to visit. The MAIIAM Contemporary Art Museum opened its doors for the first time in 2016 but has quickly emerged as one of Chiang Mai's most prestigious museums. From the moment you approach the building with it grand mirror walled entrance it is evident that you are in for a unique experience. As you walk through the doors, you will enter a converted 3,000 square metre warehouse. Inside, the MAIIAM Contemporary Art museum features a large variety of paintings, sculptures and other exhibits. The museum is located twenty minutes outside of downtown Chiang Mai and is open from 10 AM to 6 PM six days a week (closed Tuesdays) and costs 150 baht to visit. The Dara Pirom Palace celebrates the life of Dara Pirom, one of King Rama V's fifty consorts. After her retirement, she settled back in her hometown of Chiang Mai and became a great advocate for arts and culture. This museum is dedicated to her life and work, providing a unique insight into life in early 20th-century Thailand. The building itself is designed in a colonial style with Thai ornamentation that was built in 1913. The museum allows for a full tour of her home with exhibits showcasing her life with contemporary art and handicrafts. This museum is open from 9 AM to 5 PM six days a week (closed Mondays) and costs 20 baht to enter. No photographs are allowed inside the museum. The Tribal Museum of Chiang Mai celebrates the tribal heritage of the region surrounding the city. The Tribal Museum features a dedicated exhibit for each hill tribe, discussing their history and lifestyle. Each exhibit features artefacts, dioramas, videos and displays to provide a whole picture of life in each of these rural tribes. If you intend to travel outside of Chiang Mai to explore the surrounding area, the tribal museum is a must-visit to gain a better appreciation for the cultures in the surrounding area. The museum is open from 8:30 AM to 4 PM Monday through Friday and is free to visit though a small donation is appreciated. Don't forget to have a look at our Walking Tour of Chiang Mai. The perfect location to explore Chiang Mai and the old city is the akyra Manor Chiang Mai Hotel. An intimate and exclusive five star boutique hotel with restaurants and rooftop bar. The perfect sanctuary!